Walk the few blocks to historic downtown Frisco for a day of shopping and dining Drive just a few miles to six of Colorado`s World Class Ski Resorts Fully equipped kitchen for your needs. Entertain as you cook up a delicious meal. 6 seater dining room table. Cozy up to the wood burning fire place. Livingroom equipped with a full sleeper sofa. Master bedroom has a king size bed as well as a futon. Another shot of the beautiful bedroom Updated bathroom Captain bunk beds in the 2nd bedroom. Loft area has a queen bed. Hallway view Bathroom view Spiral staircase up to the loft. Grill up a meal on your back deck as you enjoy the beautiful views. Do some trout fishing in Ten Mile Creek located just outside your back door Walk just a few steps to the clubhouse to unwind in the hot tub. Rental Application Required Please email [email protected] with the full names and emails addresses of each applicant to request an e-sign application. Rental Application Required from all Applicants - Please email [email protected] with the full names and emails addresses of each applicant to request an e-sign application. 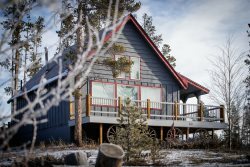 This is the ideal mountain vacation condo for a group of friends, or a couple of families, looking to plan the perfect Colorado Rocky Mountain Vacation! Whether you want to do some trout fishing in Ten Mile Creek (located just outside your back door), or walk the few blocks to historic downtown Frisco for a day of shopping and dining, or perhaps drive just a few miles to six of Colorado's World Class Ski Resorts (just 7 miles from Copper Mountain Ski Resort, 9 miles from Breckenridge and Keystone Ski Resorts, 13 miles from Arapahoe Basin Ski Area, 19 miles from Loveland Ski Area, and 23 miles from Vail Ski Resort) the location of this condo is fabulous! This cozy eleven person condo will have you wanting to stay forever. Whether you prefer to warm up by the fireplace, cook a meal on the grill, or walk just a few steps to the clubhouse to unwind in the hot tub, this place has got something for everyone!